Bariatric surgery describes a variety of procedures for treatment of morbidly/severely obese patients for whom weight loss is prescribed to treat (and prevent) obesity-related comorbidities. The three most commonly performed procedures are gastric bypass, sleeve gastrectomy (SG), and gastric banding. Weight-loss surgery has been linked to improvements in a variety of health conditions. The worldwide epidemic of obesity and type 2 diabetes has accelerated growth of the global bariatric surgery devices market. The incidence of bariatric surgeries continues to rise, along with greater reimbursement for key bariatric procedures such as SG and gastric bypass. A new study by BCC Research reveals the global market for bariatric surgery devices is expected to reach $2.2 billion by 2020, reflecting a five-year compound annual growth rate (CAGR) of 9.8%. This projection includes implanted gastric devices, gastric bypass devices, and gastric removal devices used in bariatric surgery. Gastric bypass devices (endocutters, stapling devices, curved shears, and other instruments) represent the largest product segment of the market. Gastric removal devices are the fastest-growing device segment due to increasing acceptance of SG procedures. Patients and surgeons favor less invasive/noninvasive procedures. New technologies are reducing the invasiveness of existing procedures and expanding the population of patients for whom bariatric surgery is a realistic option based on cost and/or medical grounds. As a result, the trend from open procedures to minimally invasive (MIS) laparoscopic procedures is leading market growth. Growth restraints include lack of awareness, availability, and affordability in developing nations. Lack of knowledge and information about bariatric surgery, and less disposable income in developing nations in Asia, are growth barriers for the bariatric procedures and devices market. The high cost of bariatric surgery remains a major growth barrier for the market, especially in a few Asian countries where reimbursement/insurance coverage is less (or not) available for most of the common procedures. Apart from the procedure cost, there is a significant cost associated with postsurgery care and medication, which places additional burden on patients if reimbursement is not available. A long wait time for a procedure is very common in the Western region, restricting growth of the bariatric surgery devices market. Short- and long-term complications associated with bariatric surgery are also restricting growth of this market. Venous thrombosis, incision infections, and leak at one of the staple lines in the stomach are short-term complications. Long-term complications include ulcer and hernia, lack of vitamin absorption, dehydration, body ache, dry skin, hair loss, and others. Although the incidence of gastric bypass procedures is decreasing in the United States and Asia, it remains the gold-standard weight-loss procedure among all bariatric surgeries. SG is gaining acceptance among patients and healthcare providers due to published results showing greater weight loss than with gastric banding, and the willingness of third-party payers to fund the operation. The numbers of implanted gastric devices are continuously declining across the globe due to waning interest in restrictive devices such as gastric bands and intragastric balloons, according to published studies claiming ineffectiveness in long-term outcomes. However, gastric removal devices are boosting the overall bariatric surgery devices market. Findings from a new study (published February 10 in JAMA Surgery) suggest that middle-aged and even older people enjoy a survival benefit from gastric bypass surgery. But younger people, and especially women, may not reap as much benefit. The researchers wanted to explore which age groups might gain a longevity boost after gastric bypass surgery. They studied 7,925 patients who had gastric bypass between 1984 and 2002, and 7,925 similarly obese patients who didn’t have surgery. Over the next seven years, surgery patients ages 35–44 were 46% less likely to die from any cause than people who didn’t undergo surgery. Similarly, people ages 45–54 had a 57% reduced risk of death, and those ages 55–74 had an approximately 50% reduced risk of death. The study’s lead author, Lance Davidson (from Brigham Young University in Provo, UT), said that the life-span benefit was significant for most patients who underwent surgery. However, the rate of death actually went up among those under age 35 who had the surgery. The researchers said the difference wasn’t statistically significant, but it did concern them. For patients under the age of 35, there was an increase in the number of “externally caused deaths,” which included accidental injuries, assaults, and suicides. The increase was more significant in women than in men. As for older obese individuals who are considering gastric bypass, Davidson said the benefits are probably larger as people get older because deadly conditions related to obesity are more likely to occur as a person ages. The global obese population (BMI ≥ 30) is expected to reach 794.8 million by 2020, at a CAGR of 4.2% from 2015 to 2020. The severely obese population (BMI ≥ 40) is also growing rapidly worldwide and is driving the demand for bariatric surgery. The United States is one of the major markets for bariatric surgery due to a large obese population, estimated at 89.7 million. In general, one in three adult Americans are considered clinically obese. The obese population (BMI ≥ 30) is expected to reach 109.6 million by 2020, at a CAGR of 3.4% from 2014 to 2020. The severely obese population (BMI ≥ 40) is also growing rapidly and is expected to reach 18.1 million by 2020, with an even higher CAGR of 4.4% from 2014 to 2020. 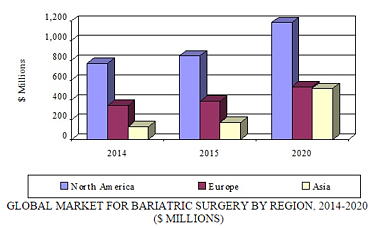 BCC Research’s study, Bariatric Surgery: Global Markets for Services and Devices, examines types of obesity, its etiology and pathophysiology, risk factors, economic burden, epidemiology, treatment and management. Analyses of global market drivers and trends, with data from 2014, estimates for 2015, and projections of CAGRs through 2020, are provided.